After global disruptions in the marketplace last fall, so-called 'wish-cycling' has driven up municipal waste disposal fees. Ecomaine’s curbside and community recycling program includes various forms of paper, plastic, metal and glass. Use ecomaine’s free Recyclopedia mobile app, available at ecomaine.org/recyclopedia, to check if individual items are recyclable. • Recyclable items may be mixed, but nothing should be larger than a 5-gallon bucket, or likely to jam conveyors in the recycling plant or injure material sorters. • Most forms of paper are OK, including books, newspapers, magazines, mail, milk cartons and paper plates, and cardboard. • Plastic detergent, milk and water bottles can be recycled, along with other rigid plastic containers, as long as they’re marked with 1-7 in a recycling triangle. • Ecomaine doesn’t recycle any plastic bags, films or wraps, flexible plastic packaging, plastic cutlery, straws, stirrers or coffee cup covers, or polystyrene foam. Maine retailers are required by law to accept and recycle plastic bags. • Recyclable metals are tin cans, aerosol cans (empty), aluminum cans and foil, pots and pans. • All glass bottles and jars are allowed, in all colors, with the lids on. • All containers should be empty and rinsed but don’t have to be perfectly clean. • Ecomaine doesn’t recycle food waste or trash; paper napkins or towels; waxed paper or boxes; wood, wire, rope, scrap metal, appliances, toys, tools, televisions, computers, bedding, curtains, rugs, clothing, shoes or accessories. • Also unacceptable is any hazardous waste such as hypodermic needles, ammunition, antifreeze, fluorescent bulbs, fuel, mercury, paint thinner, pesticides, batteries, propane or other gas tanks. • Local transfer stations often accept various kinds of household waste, including food, hazardous items and scrap metal, some of which is recycled through other processors, often for a small fee. • To learn more, go to www.ecomaine.org, call 773-1738 or seek recycling resources at your municipal office, transfer station or website. 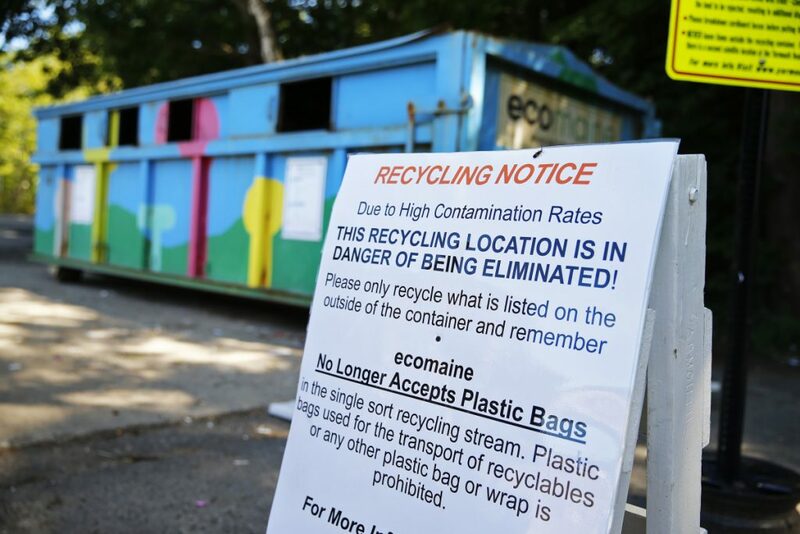 With contamination from unwanted materials hurting its ability to sell recyclables, ecomaine has been tracking the contamination levels of each truckload coming from 52 municipalities. The map below illustrates participating towns’ total recycling volumes and their average proportion of non-recyclable items delivered to the Portland waste processor since May. Mouse over a town’s pie chart to view detailed figures. Roche said it still makes sense to recycle because it reduces the waste stream to ecomaine’s incinerator, which is limited to 180,000 tons annually, and it keeps waste out of landfills, where it would just sit forever. Plus, ecomaine is getting $280 to $880 per ton for different types of plastic bottles, $193 per ton for metal cans, and $90 per ton for cardboard. Ecomaine grinds up glass jars to use in paving, he said. “It’s still worth recycling because we don’t want this stuff in a landfill,” Roche said, noting that recycling markets are traditionally cyclical and will likely bounce back. With current recycling markets so tight, the need to keep nonrecyclables out of the process has become crucial. Roche said he has seen some improvement since May. The overall contamination rate for all ecomaine communities has dropped from 12 percent to 7 percent in the last two months, but the facility is still getting truckloads containing 25 percent to 50 percent nonrecyclable items or more, according to ecomaine data. In many cases it’s apparent that people are using curbside recycling bins or community recycling containers to dispose of bagged trash and other household waste that should be brought to a municipal transfer station. Ecomaine was unable to fulfill a request for individual assessments or fees charged to member towns. In Cape Elizabeth, the roll-off containers behind Town Hall are proving to be a particular problem because residents seem to use them for regular trash disposal when the town’s transfer station is closed. In recent weeks they have been found to contain as many as 40 full trash bags, tarps, hoses, clothes, pillows, carpet, scrap metal, two microwaves, a space heater and a pool ladder. The chart below illustrates the proportion of non-recyclable material discovered in each town’s deliveries to the ecomaine recycling center since May (note: this chart only includes towns that delivered at least 100 tons during this period). Cape Elizabeth hasn’t been charged directly for its contaminated tonnage because ecomaine is dipping into cash reserves to cover the cost of incinerating nonrecyclables for its owner members. Municipalities that are associate members or contract members are getting bills for nonrecyclable tonnage. But Cape Elizabeth officials aren’t leaving the problem unchecked, especially since it’s depleting ecomaine’s cash reserves and could eventually add an estimated $60,000 to $70,000 to the town’s annual trash disposal costs, said Town Manager Matt Sturgis. He made an announcement about contaminated recycling at a recent Town Council meeting, notices have been posted on the town’s website and social media, and the town’s recycling committee is developing other strategies to reduce contamination. Sanford is a contract member of ecomaine that took action after Public Works Director Matt Hill saw the first $3,500 bill for disposal of nonrecyclables. Hill figured if the city continued to send contaminated recycling to ecomaine, its annual solid waste disposal bill would increase about $100,000. When residents didn’t heed public announcements to clean up their recycling, Hill authorized the curbside collection company to leave behind bins containing nonrecyclable items and tag them with a notice explaining why. The first week, the collection crew rejected about 250 recycling bins, prompting many residents to call the public works department, fired up with questions and complaints. Only two bins were rejected last week and Sanford’s latest bill for disposal of nonrecyclables was only $70, Hill said. Hill said he believes recycling programs will require ongoing public education efforts to keep up with changing technology and market fluctuations. Similar to a direct-mail campaign in Sanford, Cumberland last week sent notices to residents informing them that starting Sept. 1, the town will no longer collect recyclables contained in plastic bags. If recyclables are collected in plastic bags, the notice advised residents to empty them into a bin or cart and return plastic bags to retail stores, which are required to accept and recycle them under state law. The notice also advised residents to visit the Waste and Recycling page on the town’s website for more information. Ecomaine has stopped recycling plastic bags – including disposable shopping bags marked with a recycling triangle – in order to meet more stringent standards in recycling markets. The bags jam sorting equipment and are a major source of contamination that’s difficult for hand-sorters to remove completely, along with other nonrecyclable plastics. As ecomaine’s recycling revenue has fallen from an average of $108 per ton in fiscal 2017 to $4 per ton today, the waste processor has increased the number of recycling sorters from 22 to 32. Ecomaine staff members also have done recycling presentations in a dozen communities in the last two months, including Falmouth, Saco, Bridgton, Freeport and Old Orchard Beach. And they’re helping officials in South Portland – where assessments for nonrecyclables could add up to $100,000 per year – develop strategies to reduce recycling contamination across the city in the coming months. They’ve started in the city’s Redbank neighborhood, a large apartment complex where recycling contamination has been an issue for some time. Similar to Sanford, city workers are checking curbside recycling bins for obvious nonrecyclables and tagging rejected bins with instructions for proper recycling, said Julie Rosenbach, South Portland’s sustainability director. The instructions are available in various forms, including a mobile app on ecomaine’s website, and translated into French, Spanish and Arabic for the city’s immigrant population.